When most of us enter or exit a building, we rarely think about all the technology that goes into making that happen. We walk in, we walk out, and we expect to remain safe in the process. Entering and exiting is something we do dozens of times each day. We don’t think about it. We do it. Yet for many of us, there comes a time when getting out of a building as quickly as possible becomes necessary. And the normal front door operation might not do. That’s what emergency exits are designed for. But as a business owner, it’s your job to think about emergencies before they happen. It’s important to have a panic lock for emergency exits in place to ensure safety and security for your customers and employees. In a commercial setting, the standard exit lock (also called an exit device, exit bar, or exit hardware) is often in place. It’s a locking device that consists of a bar across the inside of the door; you push on it as you exit to release the door latch. If you try to open it from the outside, the door will be locked. This can be a great form of security in some circumstances. It provides numerous ways of exit in a large facility, without putting occupants at risk by giving multiple ways of entry. You can also install hardware that requires a key or code to enter, to allow only authorized personnel to access whatever is beyond the door. A panic lock (also called a panic bar, a crash bar, or a panic device) is used to provide quick unlocking of a door in an emergency situation. A panic lock is designed to save lives. It’s also designed for compliance with local and federal laws. When a panic lock is used on emergency exits, it will have a spring-loaded metal bar fixed horizontally on the inside of the door. When the lever is pressed, it activates a mechanism that unlocks the door. Pushing on the bar will release the lock, making it easy to push the door outward and escape to the outside. Release easily when pressure is applied to the push bar. It must easily open in the direction of exit travel. Have a push bar with a pressure of 15 pounds or less for easy use. Cover at least half of the width of the door, making it easy to use in emergency situations. These requirements are only in place on doors that have a lock/latch system. If it’s merely push/pull hardware without a locking mechanism, these rules don’t apply. The idea behind having panic hardware in place is to make it easy for building occupants to exit the building. There are many reasons people evacuate: accidents, threats, and fire are just a few examples. In some cases, doors have more than one purpose. Yes, they are designed to move people from one area to the next. But in commercial applications, doors along the path of an emergency route may also be designed to slow the spread of smoke and fire. Fire-rated doors are installed as a part of an overall fire-prevention strategy, which helps keep a fire contained to smaller areas within a larger facility. This helps building occupants stay safer while evacuation procedures take place and helps emergency personnel get in and out safely throughout the rescue process. All fire-rated exit devices must be panic exits by default. Panic hardware is designed to keep people safe. There are a few additional rules to keep in mind when installing panic locks for emergency exits. Once a panic door is in place as required, no additional locking device can be installed. That means you can’t install a deadlock, padlock, chain, or other locking device to increase the security of the door. The panic hardware cannot be equipped with anything that prevents the release of the lock the way it was intended. If a panic lock is used on a fire door, it must include fire exit hardware and be clearly labeled as a fire exit, stating, “Fire Door to be Equipped with Fire Exit Hardware.” Fire exit hardware is different in that it has a “dogging” mechanism that locks into place to prevent the spread of fire. A retraction device may be used to provide this dogging process, as long as the latch slips into place automatically when fire or smoke are detected. If your commercial building is at risk for other possible emergencies, such as hurricane, tornado, or earthquake, you might be under other codes and regulations. Consult the rules in your area to be sure you are in compliance with the regulations. 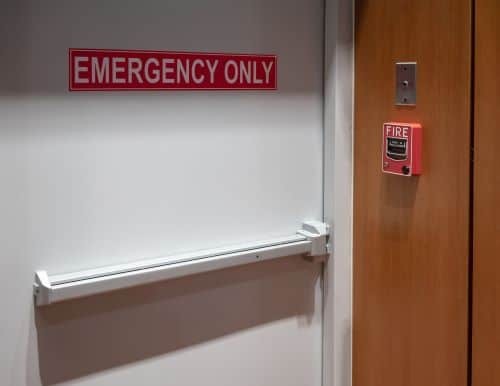 While panic locks for emergency exits are mostly installed for compliance and safety concerns, they can also be installed for convenience, security, or even durability as well. In some cases, panic locks make it easier for your customers and employees to move around. And because they add strength to your entry points, they might last for years longer than other locking mechanisms you might be considering. Have a question about the best way to protect your property and comply with laws and regulations too? Harry’s Locksmith can help. Give us a call today.